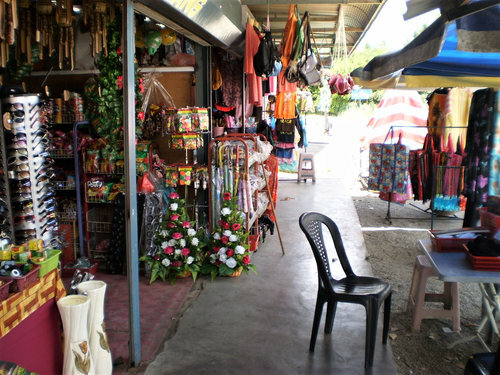 Langkawi is full of modern shopping centers & stores particularly in Kuah town, Pantai Cenang and even in Pantai Kok areas offering all kinds of touristy items and goods. However these are usually not the favorite hunting grounds for the locals for shopping when it comes to buying cheap local stuff for day to day use. Because those shops are mostly formal establishments and the items are relatively expensive. If you are looking to buy local products or purchase items like locally hand sewn clothes and hand made products like trinkets etc, or herbal & medicinal native products, then you should be looking for other places. Langkawi is one place where several natural oils and herbal products are produced from native plant roots, herbs and underwater creatures. They have magical effects on various kinds of ailments. You can get them in factories and outlets specializing in such productions. There are hawkers stalls in Padang Matsirat and also at the Black Sand Beach in Teluk Yu who sell many different items including clothes, T-shirts, gifts & souvenirs, trinkets and many knick knacks. You will also find such stall in Tanjung Rhu area selling such items by the side of the road that leads to the public beach. This is an oil produced from sea cucumbers and available in Langkawi which is known to be very effective in healing external and internal ailments including aches, wounds, ulcers and more. Islanders are great believers in the magical power of this oil. Know about how this oil is produced in Langkawi, its use & applications and where to buy them. These are the numerous small stalls set up by the villagers along both sides of the narrow road that leads to the Field of Burnt Rice venue in Padang Matsirat. 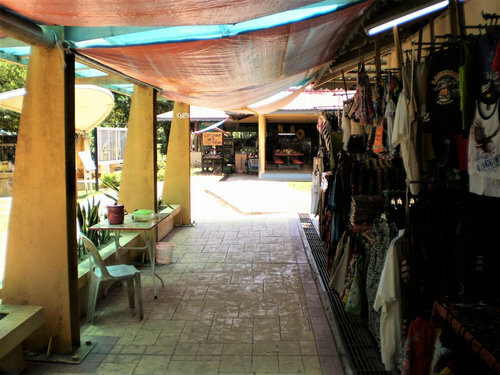 They sell all kinds of local items including trinkets, clothes & dress materials, souvenirs & gifts, artificial flowers, wallets & handbags, watches, T-shirts and many other knick knacks. Although not of very high quality, they can serve as very useful and inexpensive items. If you like to carry back home some cheap items as souvenirs or gifts, then this is a nice place to visit. But remember, most of the watches that are apparently branded are actually fakes and they are permitted to be sold here. The market remains open all through the day. It's located in Village (Kampung) Raja of Padang Matsirat, and accessible from the main road. The narrow road through the shops starts from the corner of the large car park area where the Sunday night market is held. There is another similar hawkers market at the Black Sand Beach complex. It's located at the northern shoreline of Langkawi near Teluk Yu. From the car park towards the beach, you will find a row of stalls mostly run by ladies and selling mainly women dress materials, accessories and gift & souvenir items which all locally made. A ladies top here would typically cost only RM20. Tanjung Rhu Beach area is another place to look for local products like clothes & accessories. There are rows of stalls on one side of the country road that leads down to the public beach. Although the Langkawi Night Market is mostly known for its hot & fresh local food sold at cheap prices, there are many stalls that also have extensions selling different kinds of small items like gifts & souvenirs, clothes, trinkets and so on. There are several other native products that Langkawi is well known for. Tongkat Ali (or Longjacks) is a traditional natural herbal product which is created from the plant roots found in the rainforest of Mount Mat Cincang. It is excellent for controlling high blood pressures, healing kidney and diabetic problems, fatigue, lack of sexual desires etc. Bah Kut Teh is another traditional herbal which is highly effective for revitalization of body and blood circulation. Rheumatism Oil is a natural ointment which works well for problems like back aches, cramps, sprains etc. Sarawak Bird Nest is a nutritious food which has high protein content along with other minerals and natural nutrients. It works very well for lungs problems, helps keeping healthy skin, and overall rejuvenates. So where will you get all these products in Langkawi? While there are several stores in the island selling the products, one popular store for Tongkat Ali and Gamata oil is Hj Shaari, located in Kuah town (Kedai Perusahaan Gamat Hj Shaari, Phone: 0126230441). All their products are made in the island. This is a family run business. Although HJ Shaari has passed away, his son now runs the business. Nusantra is a famous factory & mall offering wide range of Gamat Oil. However you will also find many other local products here including 'bedak sejuk' which is a powder made from rice, body care balms, shampoos made from local herbs and lot more herbal products of medicinal value.